I know I have mentioned it eleventy billion times on all social media channels, but this summer has been rotten. So wet, so cold, so grey and dull. I hear you all saying "You don't live in Scotland for the weather". I know, but even I need to dry out and get warm at least once a year! However, one thing that bad weather teaches you is how to enjoy the sun when you see it. So, when (after a terribly wet day) the sun broke through the clouds for a sunset on Sunday night, I was out like a flash. But when the chance is there, I grab it with two hands! Sun flare is best shot with your lens directly facing the camera, with the sun slightly off centre of the lens. 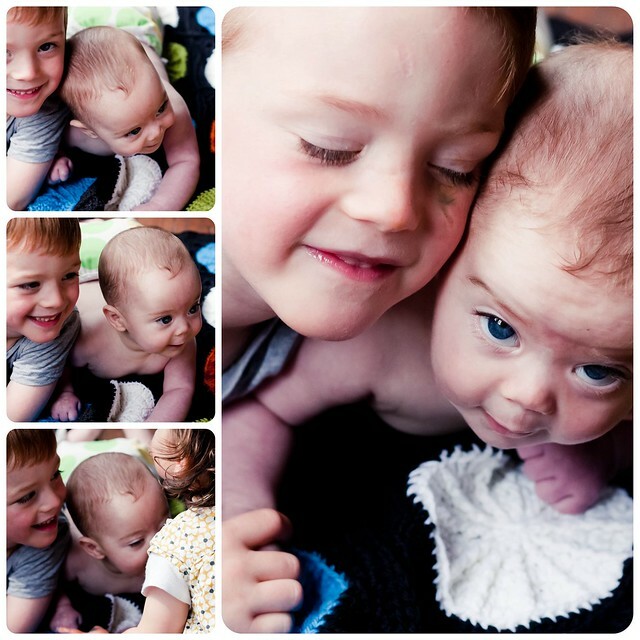 change the light metering so that you are using spot metering. This will help adjust get the correct exposure on your subject. Don't know how to do that? Read the manual. You can trick your camera by aiming it toward the darkest part of the scene and adjusting your settings then reframing and taking the photo. Simply adjust your settings so the light meter is showing slightly over exposed. This is what I usually do. I almost always adjust exposure initially by shooting in Live View (ie with the screen on), then turn that off to focus. For my camera at least focus is better through the view finder. If you are having problems focusing in the bright light, turn your lens to manual focus or close down your aperture (go to a hight f number) so that more of your scene is in focus naturally. 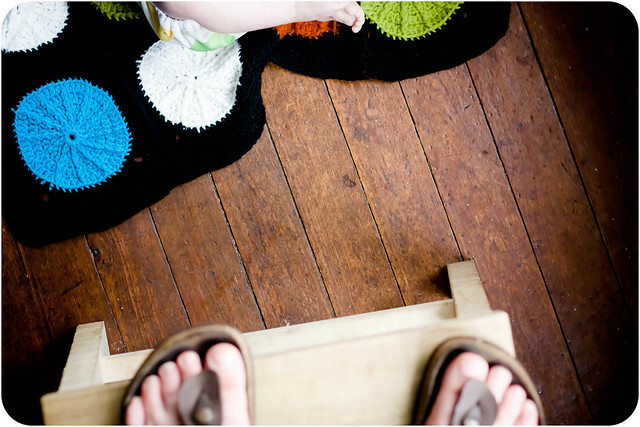 You can also focus at the bottom of your subject and reframe the photo to take the shot. A grim determination has gripped me. Jaw set, needles and hooks in hand, I have decided to knit and crochet my way out of this funk. And while there are a lot of things going on around here knit and crochet-wise, there isn't much I can show you, bar this. The easy of easiest, knit in the car and in front of the TV, don't have to think about cowls. I think the combination of garter stitch and super bulky yarn is really the equivilant of cinnamon sugar toast. Simple. Comforting. Unrefined. 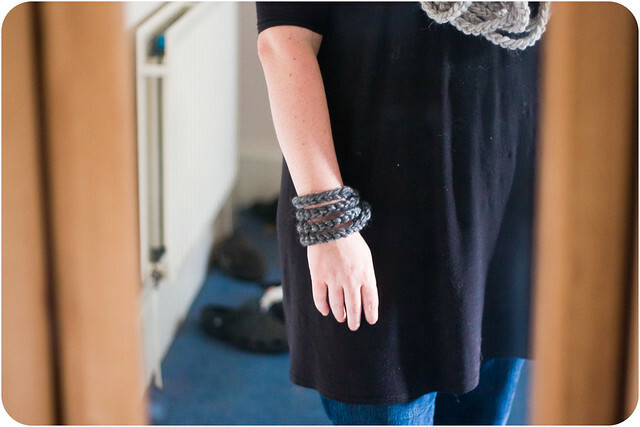 A pop of contrast makes this a bit more interesting and its wide enough to make a small wrap. It seemed a bit silly to write up the pattern, but then sometimes its nice to not to have to think. Like when one is in a funk. 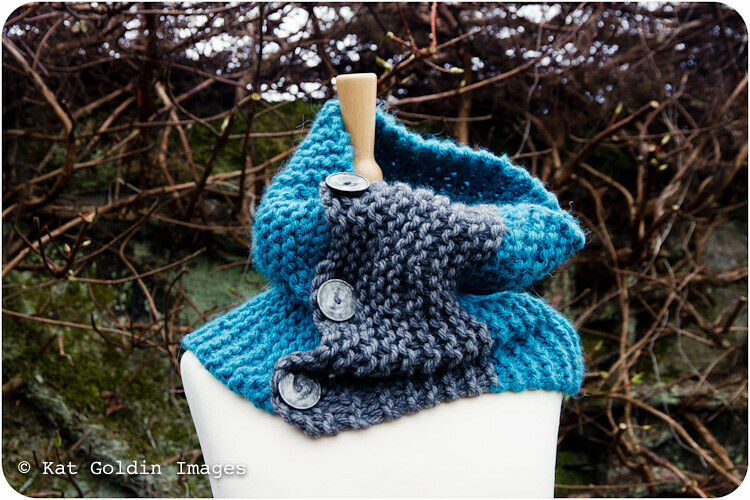 Big enough for a chunky cowl or a small wrap. 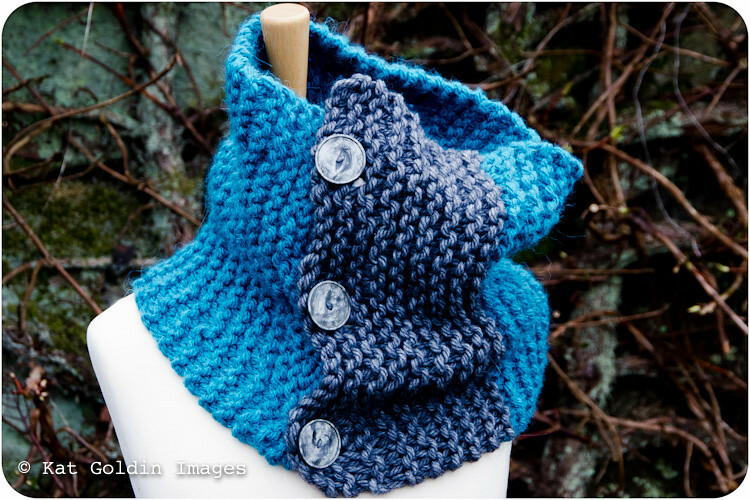 This pattern can be completed in a super bulky/super chunky yarn. © Kat Goldin 2012: While you have permission to sell finished items from this pattern, I ask that all items sold credit me, Kathryn Goldin, as the designer with a link back to my website http://www.slugsontherefrigerator.com . Under all circumstances rewriting, reselling, distributing, or copying the pattern itself is prohibited. Thanks for your understanding and cooperation. Big and easy. 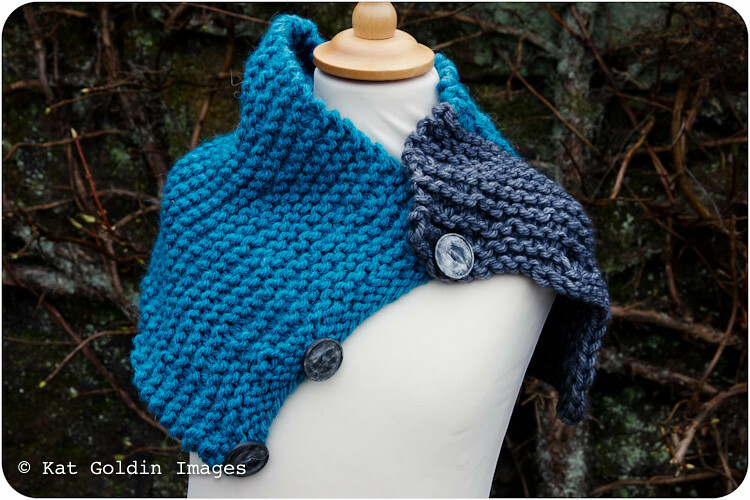 This garter stitch cowl is a simple rectangle with buttonholes at the contrast end. 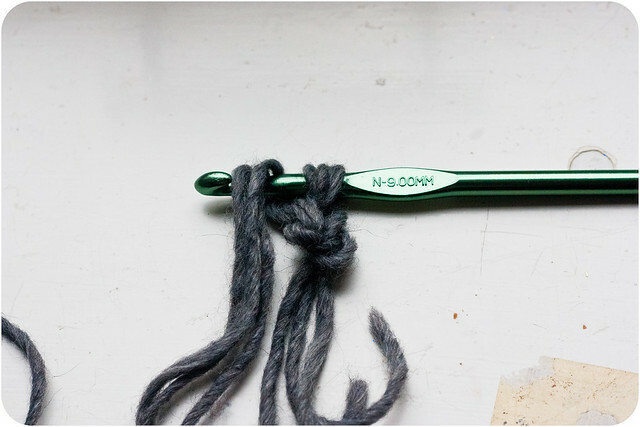 Knit Every row for 70 rows or until the piece measures 16.5 inches (43cm). 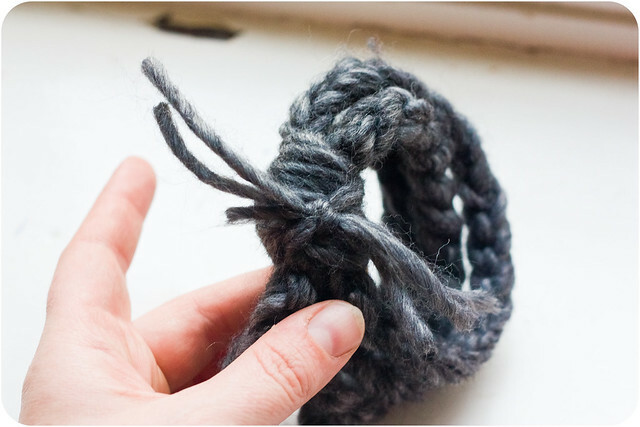 So, not quite what I planned, but how about a quick little tutorial on a rope bracelet? 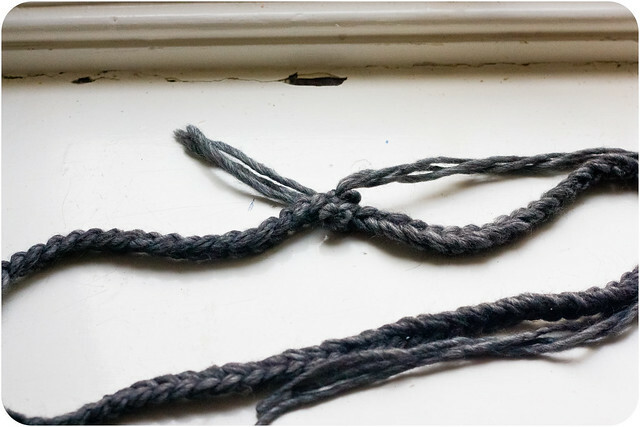 You see, I had to clean my house today and didn't have time to make a full rope scarf, which is a similar sort of idea, but a bit more involved (I can't give away all of my tricks, now can I ;) ). 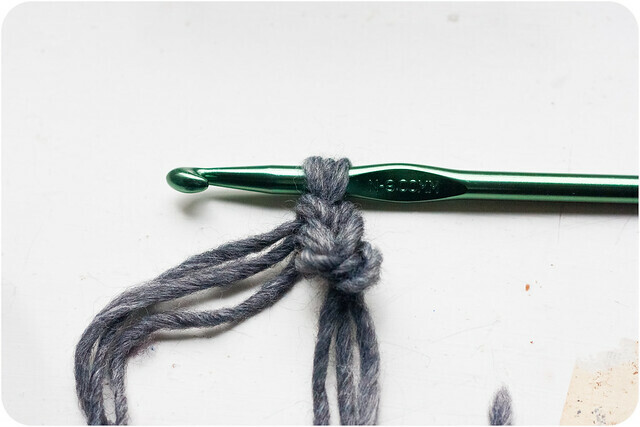 Holding the 3 ends of yarn together, tie a slip knot. Leave at least a 4inch tail after the knot. Insert your hook into the loop and pull tight. 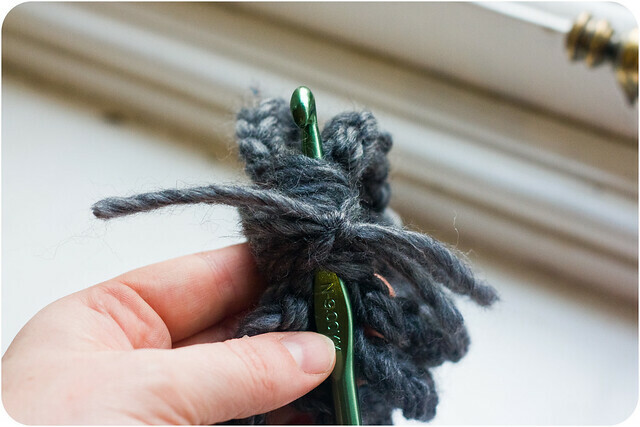 Put your yarn over the hook. 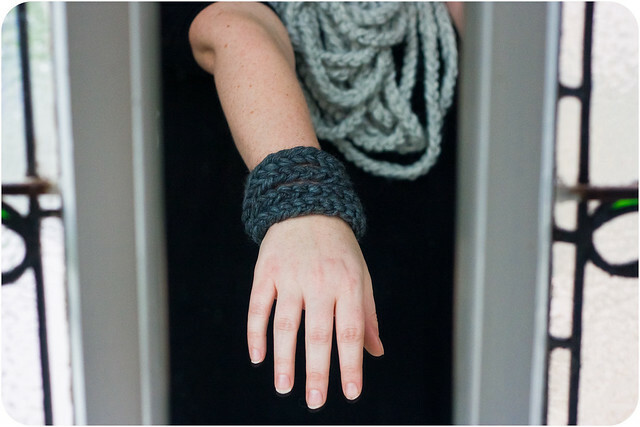 Loop the rope around your wrist. It should be loose and go around 4 times for an average size wrist. 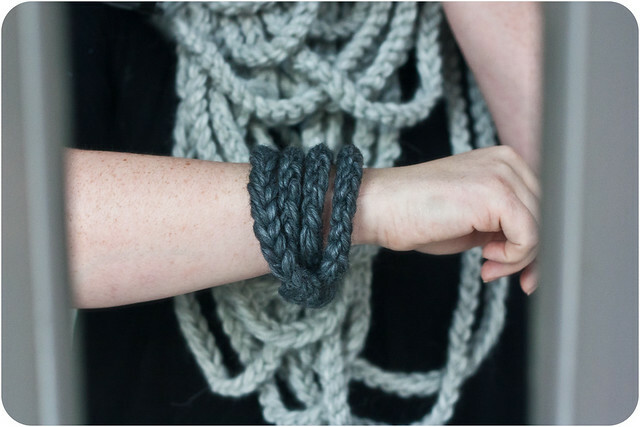 Slip the bracelet off and hold in your non-dominant hand, holding the strand of rope that goes across the project firmly. 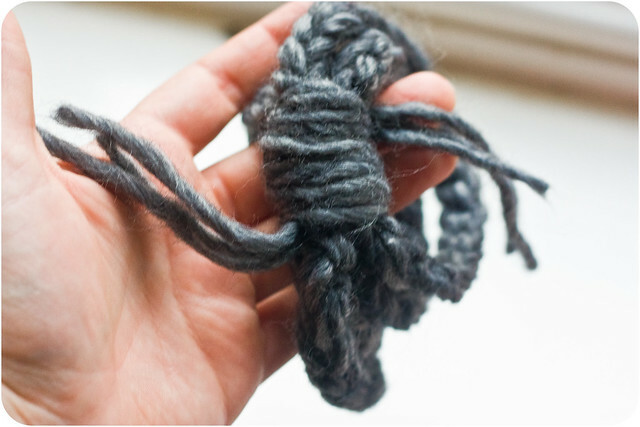 Take the longer ends of yarn and start wrapping them tightly around all of the strands of rope. Make sure your shorter tail is hanging out the bottom. 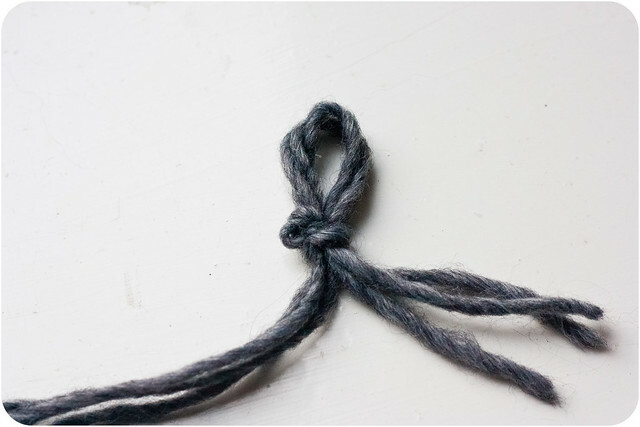 Tie the two ends off in a knot. 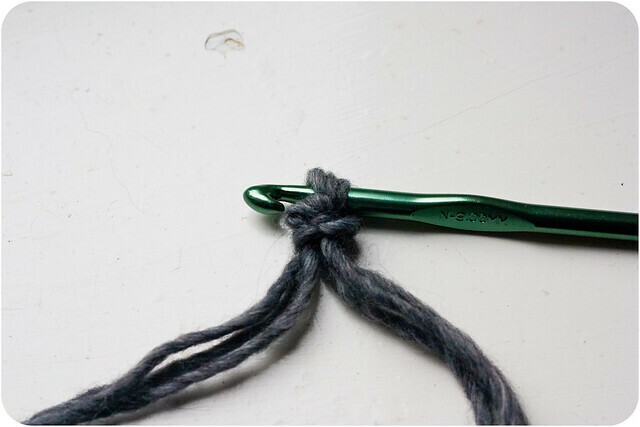 Stick your hook through the wrap and hook the loose ends, pulling them through into the wrap. Hide the ends in the wrap, trim if necessary, but not too short. It should all be neat and tidy. I did say I was supposed to be cleaning the house. 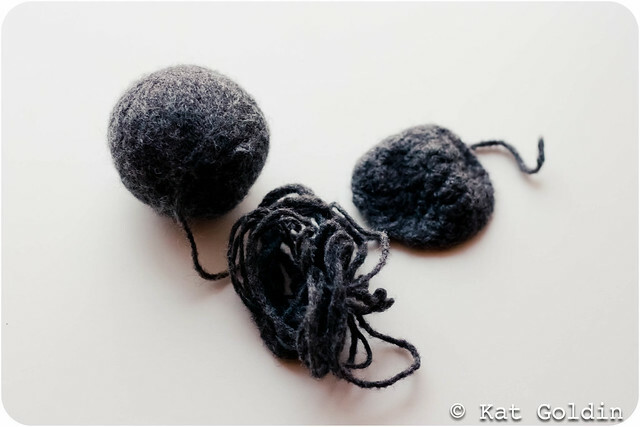 In case you were ever wondering how to make a felt ball, my method is very simple. 1. Start crocheting a hat in Cascade 220. 2. Be called away by some emergency in the house and stick said hat and ball of wool in your cardigan pocket. 3. Forget that it is there and wash said cardigan on hot. 4. Have the results be discovered by your husband whose response will be "(insert your name here). Did you wash an unfinished hat again?" One of the main reasons I started designing my own hats was because I struggled to find crochet patterns that didn't look like those crocheted Barbie toilet paper covers my grandmother had. When I first started, it was complete guess work. 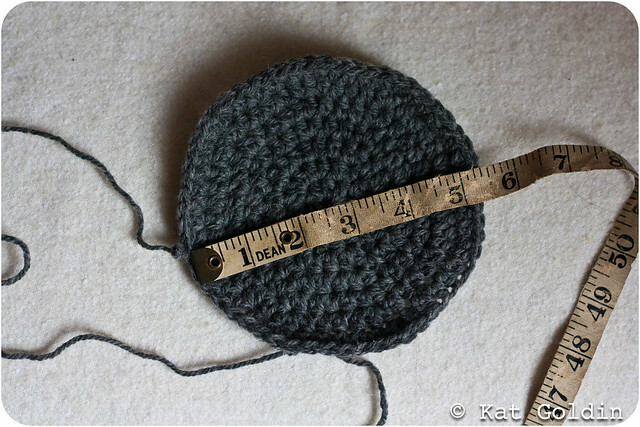 I didn't know about even increases or flat circles and crocheted everything in a UK Treble/US Double crochet. Patterns evaded me (and still do to some extent). I would always lose count of stitches and never knew where the designer intended for me to put my hook. My hats looked more like something out of the hyperbolic reef project, rather than a garment. About 3 years and countless hats later, I feel relatively confident in my ability to make a hat to fit a head. But even now, I remain baffled by the lack of readily available information on how to design your own. These type of instructions are much more prevelant in the knitting community, Elizabeth Zimmerman being the classic example. It was reading her Knitters Almanac that really taught me how to design. To save others the frustration I have gone through I thought it would be useful to lay out my process for designing a very basic beanie style hat. To keep things simple, I am laying out the posts over a couple of days. Today, I will just give an overview of the general principles and then tomorrow, we will look a the nuts and bolts of hat design. 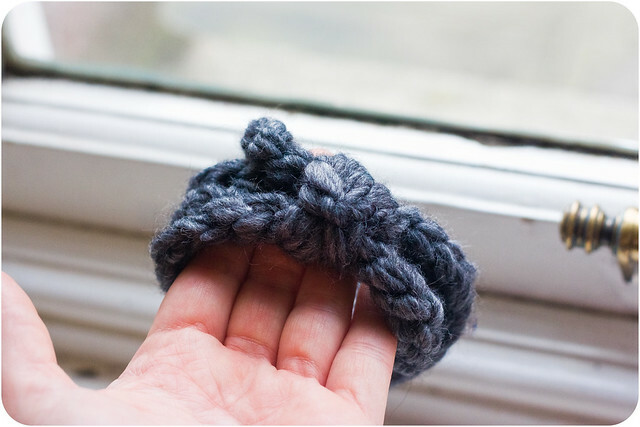 - the increases stop and the hat height is built up using rounds of the same number of stitches as the last increased row, or "worked even". Have I lost you? Let me explain. Remember geometry class and those endless problems involving pi? Well, contrary to what I told my math teacher about geometry being useless in 'real life', it actually comes in handy when making a hat. The range of measurements in sizes is usually covered by making a hat to the smallest size in an age range, quite simply because hats stretch, some more than others. 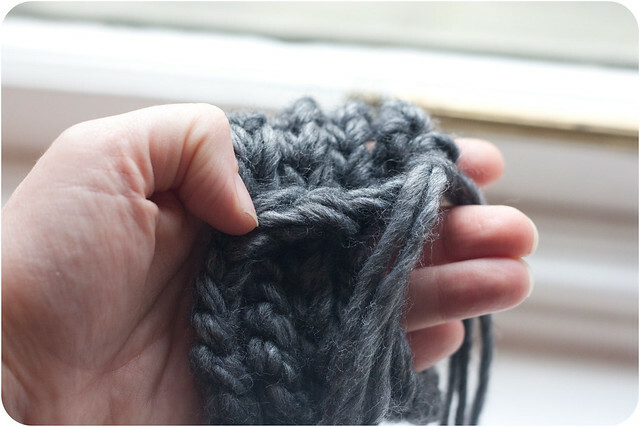 Materials like wool are stretchier than cotton and certain stitches stretch more as well. I like UK Half Treble/US Half Double Crochet for most hats as it is a good balance between creating a nice solid material, with a nice stretch in it. Longer stitches, such as UK Treble/US Double, and shell stitch have a lot of stretch. 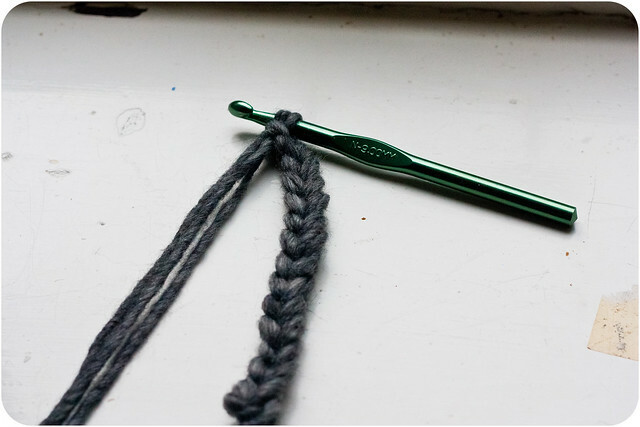 UK Double/US Single crochet is pretty tight, but does create a lovely, even fabric. So the next question is "How do I know how many rounds and how many stitches to work to for my increases?" That, my friends, is a question for another day. The full interactive workbook is available here. Its been awhile since I did a tutorial here on SOTR and since crafters all over the globe use Friday to showcase their finished objects, I thought it would be fitting to show you how I get excellent photos of my projects. 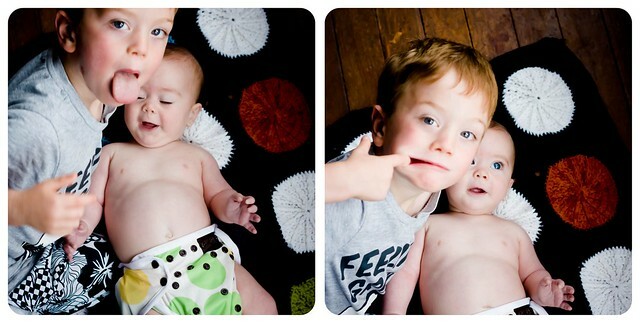 Lets say you have a finished object you would like to photograph. 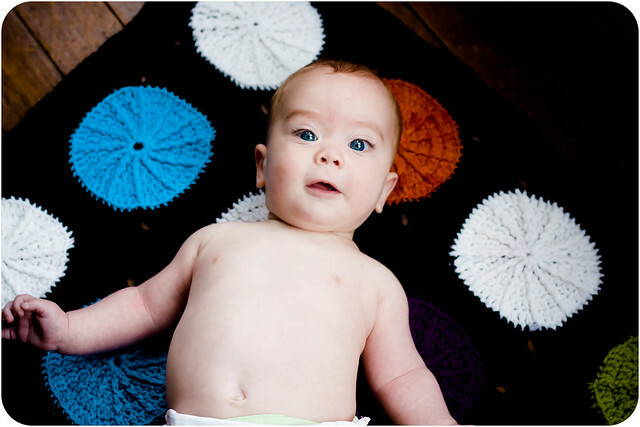 For arguements sake, lets say it is a baby blanket labouriusly made over the last 3 months for your youngest son, using various stash yarns and this modified pattern. 1. Find a quiet space to lay the poject out, ensure it has lots of light and, importantly, is free from disruption. 2. When that doesn't work, devise a new plan that involves barracading yourself behind the sofa in the bay window, whilst standing on a stool. 3. Set up the scene and camera. Attempt to get the model to look at you by making various animal noises. 3b. 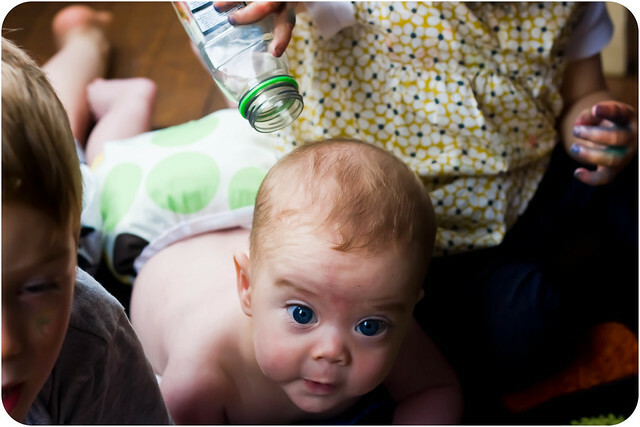 Make various empty threats about the dangers of re-entering the shot, after throwing your oldest child back over the sofa from whence he came. 4. Take as many pictures as you can while your subject practices his new skill of wriggling with purpose, thinking the entire time "I wonder if I can straighten that in Lightroom"
5. Change model's position to see if a tummy money shot is on the cards, whilst repeatedly (and ineffectually) telling all others to get out of the way. Then realise there is esssentially no blanket in the 24 photos you just snapped. 6. Sigh a deep sigh, be grateful that the bottle of apple juice found under the displaced sofa is empty and make a mental note to try and figure out why your daughter has multi-colored hands. 7. 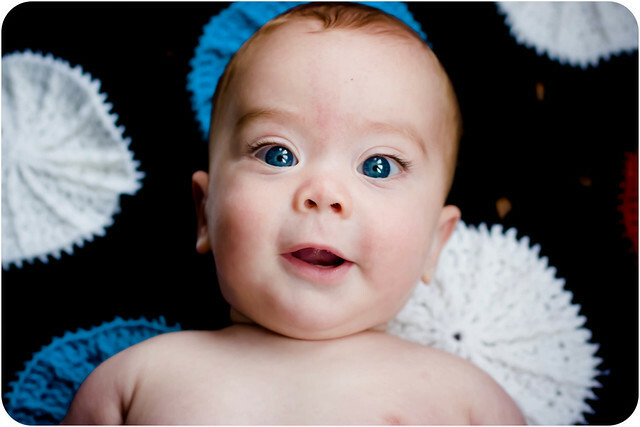 Remember why it is you don't write tutorials and that, really, crochet is just an excuse to take pictures of your children.